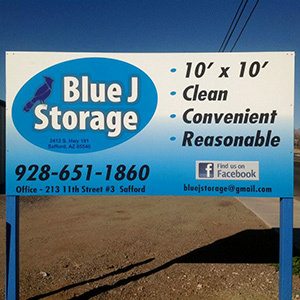 For one of the cleanest, most accessible self storage units in Safford, AZ, Blue J Storage is your number one option! No matter what you’re storing or how long you’re storing it for, we’re prepared to deliver peace of mind in the superior quality of our convenient units. Why Choose Blue J Storage in Safford, AZ? Putting your belongings into a self storage unit is about more than just finding a place to house the items you no longer have space for—it’s about keeping your possessions safe, secure and out of harm’s way at all times. No one understands this better than Blue J Storage and we strive to maintain our facilities to the highest quality standards around, giving you complete peace of mind that when you store with us, you’re doing so with confidence. From our immaculate facilities to our top notch storage standards, you’ll never have a worry about your items stored with us! We have been in the self storage business for over a decade. We offer bulk discounts for multiple unit rentals. Each of our units is accessible 24/7/365. Our units are competitively priced upfront to give you the best value possible. We offer 24-hour customer service and your satisfaction is our number one priority.